The Saturday before Labor Day is traditionally considered to be International Bacon Day. So that makes it today! Let’s face it: there are few foods as magical as bacon. Add bacon to just about any dish you’re preparing, and it elevates it to incredible new heights of flavor. The BLT is possibly the greatest food combination ever invented: just a few simple, fresh ingredients, when placed together, transforming into one of the most amazing sandwiches on planet Earth. But I also make my own. To cure bacon, all you really need is salt and sugar, and what they in the curing biz call “pink salt,” which is not to be confused with salt that happens to be pink, like Himalayan salt you would find in a gourmet store. Pink salt is bright pink to let you know that this is a special salt that should only be used in small quantities for curing. The reason is it contains nitrites. Nitrites delay the spoilage of the meat, and help keep the flavors of spices and smoke. They also keep the meat nice and pink instead of an unappetizing gray. That’s good. But nitrites can break down into nitrosamines, which have been known to cause cancer in lab animals. But let’s face it: you would need to eat a ton of cured meat to really worry about this. Mix the ingredients well. An important note: all salts do not all weigh the same, so go by the weight and not a cup measurement. This is what I’m serving my guests at Christmas dinner. 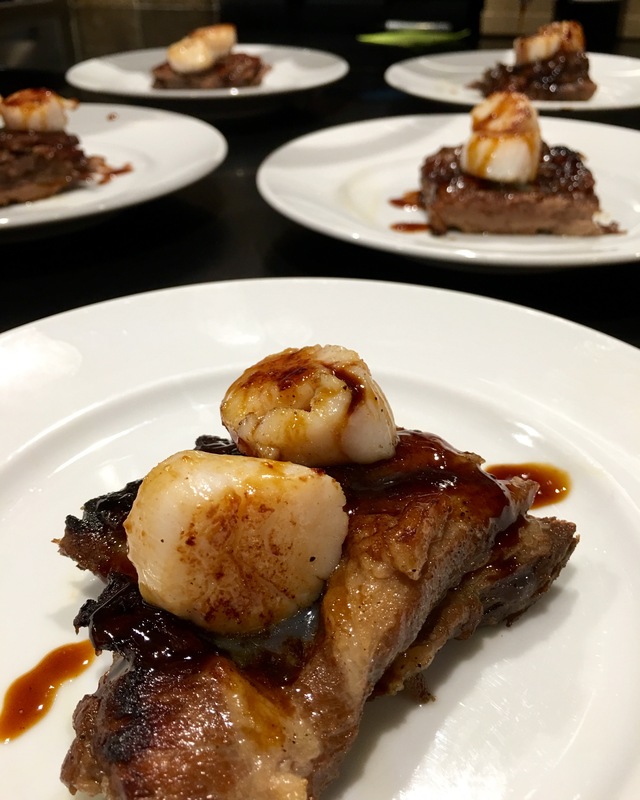 It’s a rich and delicious surf-and-turf, using wild Texas boar and locally caught Rhode Island scallops, that beats steak and lobster hands-down! Wild boar isn’t an ingredient you can find everywhere, but pork belly is, and it works just fine. Season the belly with salt and pepper. On medium-high heat, melt the leaf lard, then sear the meat on all sides in an oven-proof pot big enough to hold it in one layer. Add the carrot, celery, onion, fennel, thyme and peppercorns and continue cooking for another 5 minutes, until caramelized. Add the beef stock and the cider. Cover the pot with a lid or seal with aluminum foil, and braise the belly in the oven for 3 hours, until tender. Remove the pot from the oven, carefully remove the pork belly, and put it on a plate. Cover it with foil. If you’re cooking earlier in the day, you can place the belly in the fridge at this point. Strain the leftover braising liquid from the pot and discard the vegetables and thyme. Skim off the excess fat. If starting this dish earlier in the day, you can put this liquid in the fridge and the fat will harden, making it easier to remove. 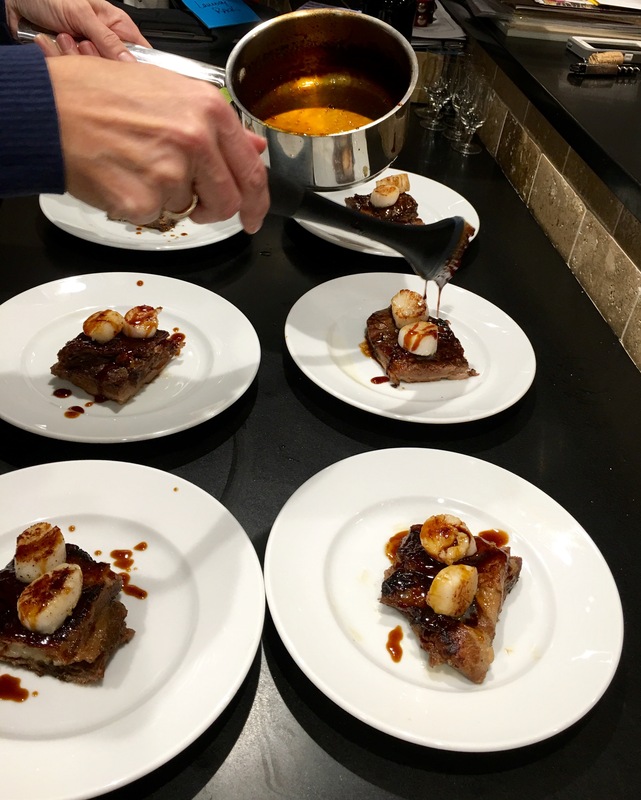 In a small saucepan, reduce the brazing liquid by half, then add the espresso and honey. Cook a few more minutes until the sauce thickens. When it coats the back of a spoon, it’s ready. Set aside. When you’re ready to serve, heat a pan on high heat with a little more leaf lard. Cut the belly into equal pieces and sear on all sides for about a minute. Place the scallops in the same pan, season with salt and pepper, and sear them on both sides, being careful not to overcook them. To serve, place the belly on a plate. Top with a scallop or two. Drizzle glaze over the top. Season with Fleur de Sel or sea salt and serve immediately. Always good to have a lovely food stylist around to make it look pretty. As if I needed more reasons to eat bacon, this Saturday, September 3rd, is International Bacon Day! Bacon comes from the pork belly. One of the places I buy pork bellies is from my friends at Fire Fly Farms in Stonington, CT (http://www.fireflyfarmsllc.com). 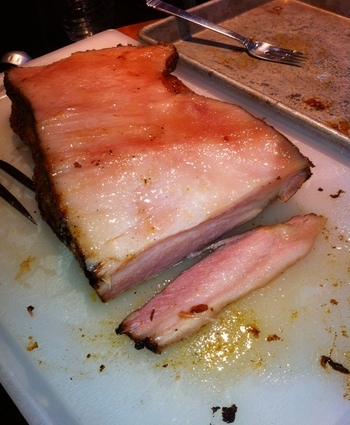 I also get Berkshire pork bellies from Heritage Pork International (http://www.heritagepork.com). I follow the simple curing techniques outlined in “Charcuterie,” a great book written by Michael Ruhlman and Brian Polcyn. To cure bacon, all you really need is Kosher salt and what they in the curing biz call “pink salt,” which is not to be confused with salt that happens to be pink, like Himalayan salt you’d find in a gourmet store. Pink salt is bright pink—to let you know that this is special salt that should only be used in small quantities for curing. The reason for that is because it has nitrites. Nitrites delay the spoilage of the meat, and help keep the flavors of spices and smoke. They also keep the meat nice and pink instead of an unappetizing gray. That’s good. But nitrites can break down into nitrosamines, which have been known to cause cancer in lab animals. But let’s face it: you would need to eat a ton of cured meat to really worry about this. Once you rub the pork belly thoroughly, place it in a Ziploc bag, squeeze the air out of it, and seal it tightly. another method is to wrap it tightly in plastic wrap, then seal it with tape. Place it in the fridge for a couple of weeks, flipping it over every few days to let gravity do its work. You’ll see that the salt will draw moisture out of the meat and form a brine. This brine will continue to cure your pork belly, so leave it in there. After a few weeks, once the pork belly has been cured, wash the brine off the meat, pat it dry with paper towels. Now it’s time to cook. 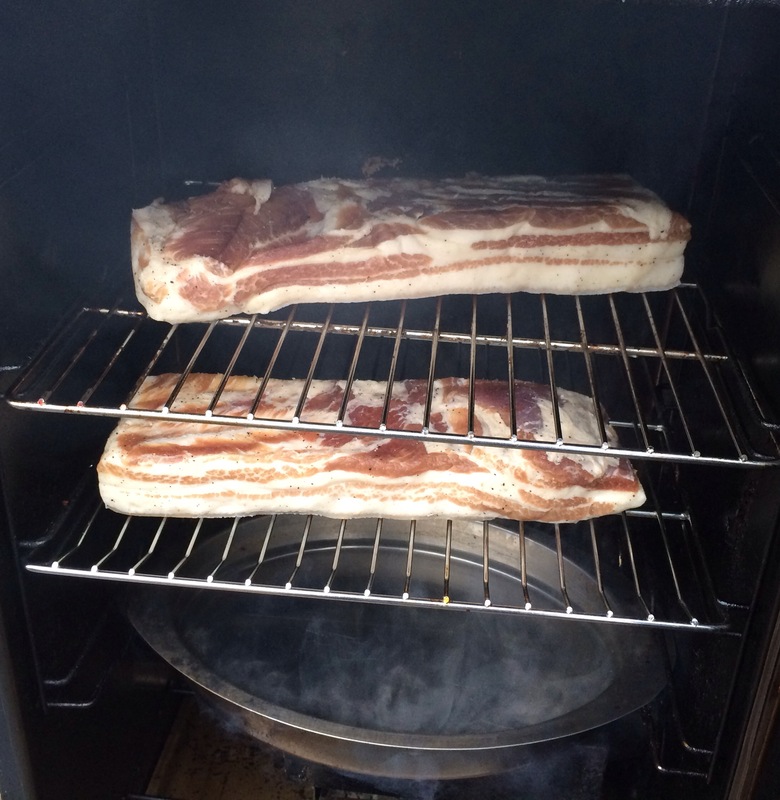 You can simply cook the pork belly at 200 degrees for about 2 hours, until the internal temperature reaches 160 degrees, but I always place the pork belly in a smoker, cooking it at 250 degrees for 1 hour, then add hickory chips and smoke it at 250 degrees for at least another hour. The reward is so worth the effort. You still have to fry it at this point…you can’t just take a bite out of the slab! But that first slice you cut off your bacon and toss in a pan to lightly fry for a few moments will be the best bite you’ve ever had in your life! The is a killer recipe that I’ve waited a long time to prepare. My hats off to chef Chuck Hughes for the inspiration. My hats off to my buddy, Dr. Chezwick, who sent me a gift of wild boar bellies. Locally caught Rhode Island scallops in season complete the dish. The Saturday before Labor Day is traditionally considered to be International Bacon Day. So that makes it September 5th this year. I buy my bacon on-line from Burger’s Smokehouse, a family-run business in Missouri that not only sells some great bacon (get the thick-sliced country bacon—my favorite), but also smoked turkeys, ham and more. Bacon comes from the pork belly. One of the places I buy pork bellies is from my friends at Fire Fly Farms in Stonington, CT (www.fireflyfarmsllc.com). I follow the simple curing techniques outlined in “Charcuterie,” a great book written by Michael Ruhlman and Brian Polcyn. To cure bacon, all you really need is salt and sugar, and what they in the curing biz call “pink salt,” which is not to be confused with salt that happens to be pink, like Himalayan salt you would find in a gourmet store. Pink salt is bright pink—to let you know that this is special salt that should only be used in small quantities for curing. The reason for that is because it has nitrites. Nitrites delay the spoilage of the meat, and help keep the flavors of spices and smoke. They also keep the meat nice and pink instead of an unappetizing gray. That’s good. But nitrites can break down into nitrosamines, which have been known to cause cancer in lab animals. But let’s face it: you would need to eat a ton of cured meat to really worry about this. Mix the ingredients well. An important note: all Kosher salts do not all weigh the same, so go by the weight and not a cup measurement. Once you rub the pork belly with the basic dry cure, place it in a Ziploc bag, squeeze the air out of it, and seal it tightly. Place it in the fridge for a couple of weeks, flipping it over every few days to let gravity do its work. You’ll see that the salt will draw moisture out of the meat and form a brine. This brine will continue to cure your pork belly, so leave it in there. Once the pork belly has been cured, wash the brine off the meat, pat it dry with paper towels. Now it’s time to cook. 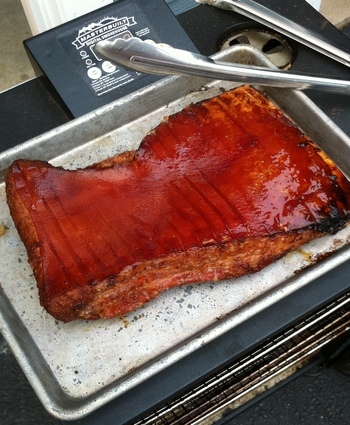 You can simply cook the pork belly at 200 degrees for about 2 hours, until the internal temperature reaches 160 degrees, or place the pork belly in a smoker, cooking it at 250 degrees for 1 hour, then adding hickory chips and smoking it at 250 degrees for another hour. I use my digital smoker to do this. The reward is so worth the effort. That first slice you cut off your bacon and toss in a pan to lightly fry for a few moments will be the best bite you’ve ever had in your life! There are few foods as magical as bacon. Add bacon to just about any dish you’re preparing, and it elevates it to incredible new heights of flavor. 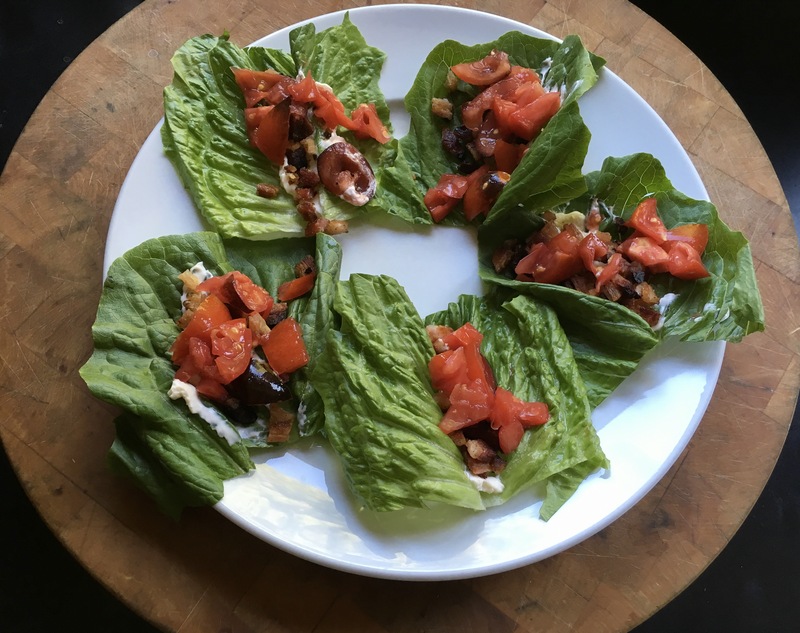 The BLT is possibly the greatest sandwich ever invented: just a few simple, fresh ingredients, when placed together, transforming into one of the most amazing treats on planet Earth. And it all depends on the bacon. For many years, I’ve bought my bacon on-line from Burger’s Smokehouse, a family run business in Missouri that not only sells some great bacon (get the thick-sliced country bacon—my favorite), but also smoked turkeys, ham and more. The prices are excellent and they include shipping. But it was time to take the next step: I had to make my own bacon! Bacon comes from the pork belly. So I bought a few slabs of insanely good pork from my friends at Fire Fly Farms in Stonington, CT (www.fireflyfarmsllc.com), and followed the simple curing techniques outlined in a great book about making all kinds of prepared meats (sausages, salamis, and of course, bacon): “Charcuterie,” by Michael Ruhlman and Brian Polcyn. To cure bacon, all you really need is some salt and some sugar, and what they in the curing biz call “pink salt,” which is not to be confused with salt that happens to be pink, like Himalayan salt you would find in a spice catalog. Pink salt is bright pink—to let you know that this is special salt that should only be used in small quantities for curing. And the reason for that is because it has nitrites. Nitrites delay the spoilage of the meat, and help keep the flavors of spices and smoke. That’s good. But nitrites can break down into nitrosamines, which have been known to cause cancer in lab animals. But let’s face it: you would need to eat a ton of cured meat to really worry about this. Combine these ingredients well. You won’t need all of it unless you’ve got a lot of pork belly. An important note: kosher salts do not all weigh the same, so that’s why I go by the weight and not a cup measurement. Once you rub the pork belly with the basic dry cure, place it in a Ziploc bag, squeeze the air out of it, and seal it well. Place in the fridge for about a week, flipping it over a few times to let gravity do its work. You’ll see that the salt will draw moisture out of the meat and form a brine. This brine will continue to cure your pork belly, so leave it in there. Once the pork belly has been cured, wash the brine off the meat, pat dry with paper towels. Now it’s time to cook. 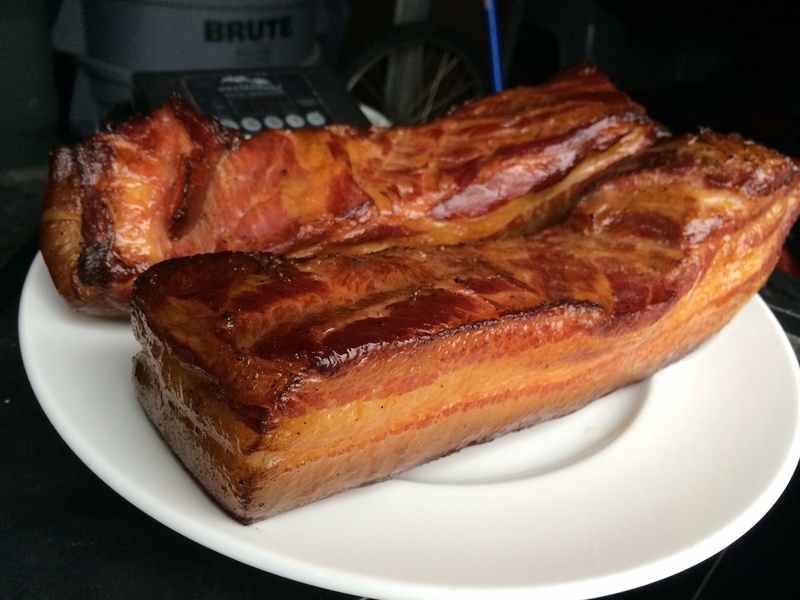 You can simply cook the pork belly at 200 degrees for about 2 hours, until the internal temperature reaches 160 degrees, or do what I did: place the pork belly in a digital smoker, cooking it at 250 degrees for 1 hour, then adding hickory chips and smoking it at 250 degrees for another hour. Bacon, straight out of the smoker. 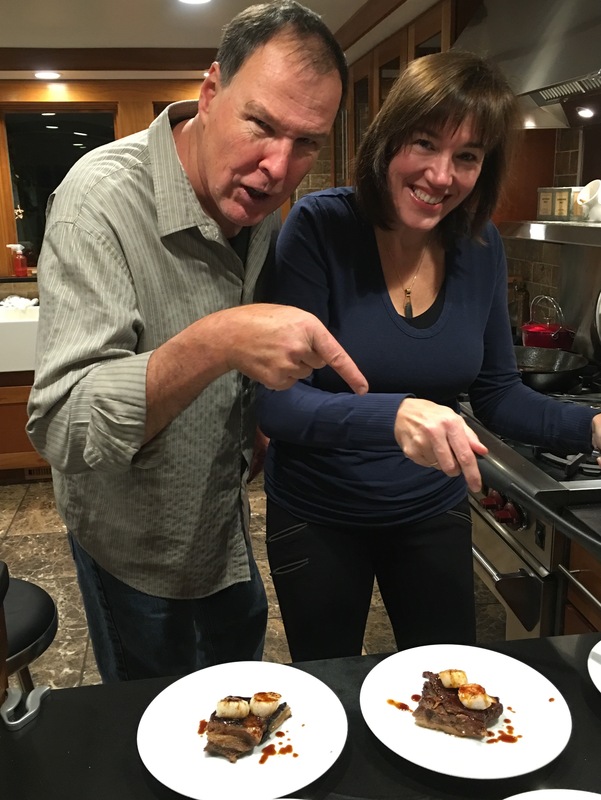 Let me tell you…that first slice you cut off that bacon and toss in a pan to lightly fry for a few moments will be the best bite of bacon you have ever had in your life! The reward is so worth the effort. If you don’t want to bother going online or if you don’t have a local farm to buy your pork, simply go to your favorite butcher and ask for pork belly. It’s usually available. And if you’re making one slab of bacon, why not make it three or four? It freezes well. And…you will eat it. You know you will! Sliced, and ready for frying. Combine these ingredients and rub on all sides of the pork belly. Place in Ziploc bags and squeeze all the air out of them. Place in a container in the fridge and turn them over every day to let gravity do its work. A brine will form inside the bag…this is good. It will cure the pork belly. After about a week, remove the pork bellies and rinse them with cold water. Pat them dry with paper towels and then proceed to the smoker. I use a digital smoker, so I set the temp for 250 degrees and cook the pork bellies at this temperature for one hour. I then add hickory chips and smoke the bellies at 25o degrees for one more hour. At this point, you have achieved bacon! While the bellies are still warm, you can easily slice off the pork skin off the belly. I discard it. 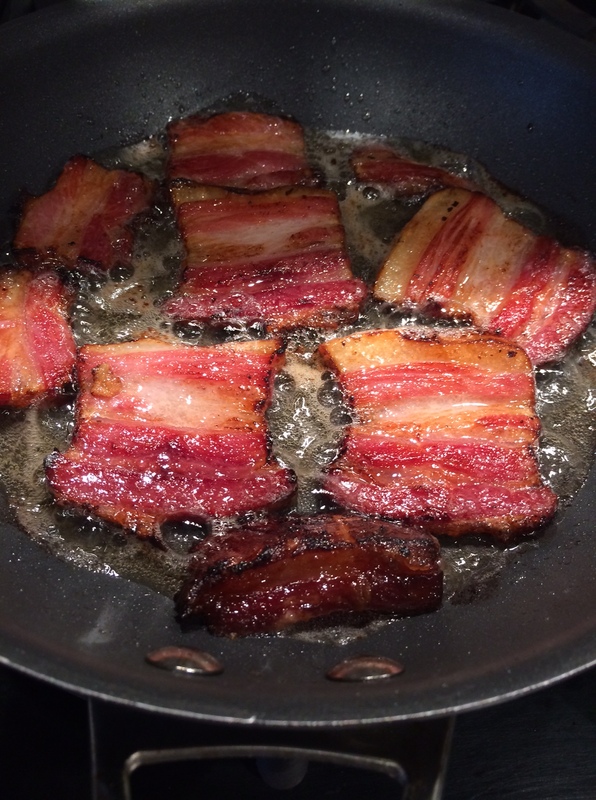 Slice the bacon into whatever thickness you like, and fry some up immediately! Once the rest of the bacon has cooled to room temp, cut them into chunks, wrap individually, and freeze until ready to use.